This is one of the first things I tried when I came to Bulgaria, here on almost every street corner there is a “Banicharnitsa” which is a shop that sells freshly baked doughy goods (mostly savory, but also some sweet) I tried it from one of these shops and it immediately became one of my favorite Bulgarian baked good. These are fluffy soft rolls filled with crumbled feta cheese and melted butter, their name in Bulgarian is “Milinki”. In the video I am kneading the dough by hand to show you that there is nothing difficult about it and that you don’t need a machine, but if you have a stand mixer, feel free to use it. This is slightly different than the traditional way to make it, you will notice that the dough itself is made with olive oil; originally it’s made with vegetable oil, but I think that the olive oil tastes better. In a large bowl combine the warm milk and vinegar, mix and allow it to sit for 5 minutes or until the milk looks curdled. Add the egg and sugar to the curdled milk, whisk until everything is well-combined. Crumble in the fresh yeast, whisk until it is completely dissolved. Finally add in the olive oil, whisk until completely combined. Add all of the flour to the wet ingredients, then sprinkle your salt on top (it’s better if the salt doesn’t have direct contact with the yeast until some of the flour is mixed in). Start mixing with a large wooden spoon just until your dough comes together. Lightly flour your work surface, then transfer your dough there and begin kneading. Try to add as little flour as possible, I find that I only need to add flour once and my dough doesn’t seem to stick anymore. Knead the dough for 12 minutes by hand. You can also use a stand mixer with a hook attachment if you have one, knead that for 8 minutes. Once you are done kneading your dough, oil the same bowl you mixed it in generously with some olive oil, shape your dough into a ball, place it in the bowl, and roll it in the oil to get it completely coated. Tightly cover your bowl with a plastic bag or clingfilm, place in a slightly warm draft-free area like a kitchen cabinet or the microwave, let it rise for 1 hour - 1 1/2 hours or until it has doubled in size (mine usually takes 1hour20minutes). Once your dough has doubled, punch it down to deflate it and divide into two equal pieces. Generously butter an 10x14 inch (36cm x 24cm) deep baking pan, place it in the fridge or freezer to allow the butter to harden and create a coating. Lightly flour your work surface, take one piece of dough and roll it out into a rectangle about 16”x9.5” (40cm x 23cm) with your rolling pin. Brush the top with about 2 tbsp of the melted butter. Crumble on 1/2 of the cheese, press it on lightly to make it stick. Roll your rectangle up lengthwise as tightly as possible, to form a log. Cut the log in half, then each half into 5 equal pieces (use a ruler if you like). Line them up in your pan, leave space for the remaining dough as well (to fit all 20 pieces I do a 4x5 set up). Repeat these steps with the other piece of dough and line them up in the pan. In the end you will have 20 rolls. Brush the tops of the rolls with some of the beaten egg. Cover the pan with clingfilm or a plastic bag, let the rolls proof for another hour or until doubled in size. See the Notes section if you want to bake these the next day. Preheat your oven to 350ºF (180ºC) with the fan switched on 15 minutes before your rolls are done proving. Position the oven rack in the lower third of the oven. 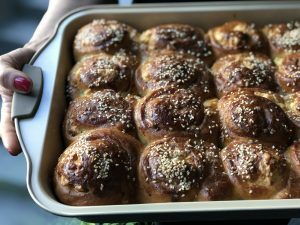 Once your rolls have doubled in size, brush them with some more egg wash, sprinkle with the sesame seeds and bake for 25-30 minutes, they will have puffed up and browned nicely on the top. Once they are done baking, brush the tops with the remaining melted butter and cover them with a clean tea towel for 15 minutes so they can get soft and moist. Enjoy immediately or store in an airtight container for up to 3 days. You can heat these up in the oven or toaster to freshen them up. See notes for freezer tips. Do all of the steps “For the dough” 1-5, then “To assemble and bake” steps 1-4 without letting them proof at room temperature. After you cover the rolls with clingfilm or a plastic bag, place in the fridge (they will slowly proof there until the morning). The next day just continue with preheating the oven and baking them at the same temperature and time. Once the rolls have cooled down completely pull them apart and place in an airtight container, place the container in the freezer. You can defrost them in the oven at 350ºF (180ºC) for about 8-10 minutes or until they are completely warmed through.